The purpose of the present study was to assess imaging findings of primary immunoglobulin G4 (IgG4)-related cervical lymphadenopathy. Five consecutive patients with clinically, serologically, and histopathologically confirmed primary IgG4-related cervical lymphadenopathy without any other organ involvement were included. 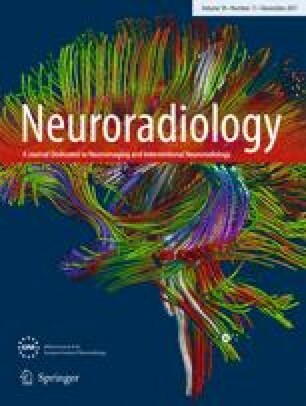 All patients underwent contrast-enhanced computed tomography (CT), and four underwent 18F-fluorodeoxyglucose (FDG)-positron emission tomography (PET)/CT. We retrospectively reviewed the images and assessed the number, size, location, central necrosis, perinodal infiltration, penetrating vessels, and maximum standardized uptake values (SUVmax) of the enlarged cervical nodes. Thirteen enlarged cervical nodes measuring larger than 10 mm in minimum diameter were identified. The maximum and minimum diameter of enlarged nodes ranged from 1.2 to 3.2 cm (median, 1.8 cm) and from 1.0 to 1.9 cm (median, 1.2 cm), respectively. Lymphadenopathy was unilateral in all patients, and eight enlarged nodes were located at level IB (62%), one at level II (8%), three at level IV (23%), and one at level V (8%). Central necrosis was not seen in any nodes. Perinodal infiltration was seen in only one node (8%), and penetrating vessels were seen in seven nodes (54%). The median SUVmax of nine nodes was 4.45 (range, 2.08–12.44). Eight enlarged nodes (62%) were located in the submandibular region. Central necrosis was not observed in any nodes and perinodal infiltration was observed in one node (8%).